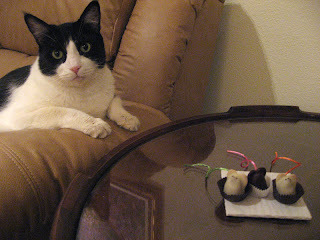 Dylan & Co.: Chocolate Mice? For Ryan's birthday, our friend Kathy sent him a gift - something "perishable" and overnighted to our door. We wondered what it could be, but never would have guessed. She's probably the most creative gift-giver I know. Yeah, it's a box of handmade chocolate mice, complete with silk tails, and shipped from New Hampshire. And for those of you wondering why she sent him chocolate mice, it's actually quite simple and sweet. Ryan's research involves genetically engineered mice in a study related to nicotine addiction. And when I asked her how she found the idea for his gift, she replied, "the internet has everything!" - I guess she's right! I hope you had a great birthday, Ryan.